CHU, Judy, a Representative from California; born in Los Angeles, Los Angeles County, Calif., July 7, 1953; B.A., University of California, Los Angeles, Calif., 1974; Ph.D., California School of Professional Psychology, Los Angeles, Calif., 1979; professor, Los Angeles City College, Los Angeles, Calif., 1981-1988; professor, East Los Angeles College, Monterey Park, Calif., 1988-2001; member of the Garvey, Calif., school district, 1985-1988; member of the Monterey Park, Calif., city council, 1988-2001; Mayor of Monterey Park, Calif.; member of the California state assembly, 2001-2006; member of the California board of equalization, 2006-2009; vice chair of the California board of equalization, 2009; elected as a Democrat to the One Hundred Eleventh Congress, by special election, to fill the vacancy caused by the resignation of United States Representative Hilda Solis, and reelected to the five succeeding Congresses (July 14, 2009-present). 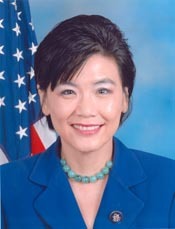 "Judy Chu" in Asian and Pacific Islander Americans in Congress, 1900-2017. Prepared under the direction of the Committee on House Administration by the Office of the Historian and the Office of the Clerk, U.S. House of Representatives. Washington: Government Publishing Office, 2018.